Antía Fernández López was born in Allariz (Ourense). It is Telecommunication Engineering, Master’s Degree in Telematics Engineering and MBA from the IESIDE business school. 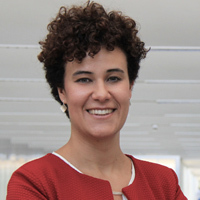 She is currently working as co-director of the intelligent services area at Gradiant and has worked as an H2020 project evaluator for the European Commission. She has participated in several projects related to the development of decoders, management systems and distribution of IP services and cable networks and quality service for sensor networks. From 2010 to 2014 her major experience focused on mobile services, she has worked as project manager in national and international projects on systems for different sectors: tourism, IP voice security, security with NFC technology and interaction with vehicles for alert the driver. In these years she focuses on the research of Cybersecurity, Cloud Computing and Learning Analytics. She has also participated in 3 European projects and directed more than 15 research projects for national and local companies together with the team, doubled up to 35 engineers. After 10 years at Gradiant, she is now a co-director of the Intelligent Systems area in Gradiant, as well as responsible for the services offered by Gradiant.